The Odes of Solomon are believed to have been written around the year 100 A.D., and include strong parallels to the Dead Sea Scrolls. Scholars have debated whether the Odes should be considered Jewish, Christian or Gnostic, and whether they were first written in Greek, Hebrew or Syriac. Early Christian writings refer to and quote from them. A Syriac manuscript containing the text of most of the Odes was discovered in 1909 by the English scholar J. Rendel Harris, and other partial texts in various languages have also been found. There are 42 Odes. Some fragments are still missing from Odes I and III, and no part of Ode II has yet been found. 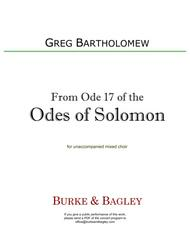 For these choral settings, I selected text from four of the Odes of Solomon which I found particularly compelling. The anonymous translation I have used comes from The Gnostic Society Library.From the Odes of Solomon was premiered in concert on June 2, 2002, by the Ars Brunensis Chorus under the direction of conductor Roman Valek and choirmaster Dan Kalousek at the Husov Sbor, in Brno, Czech Republic. 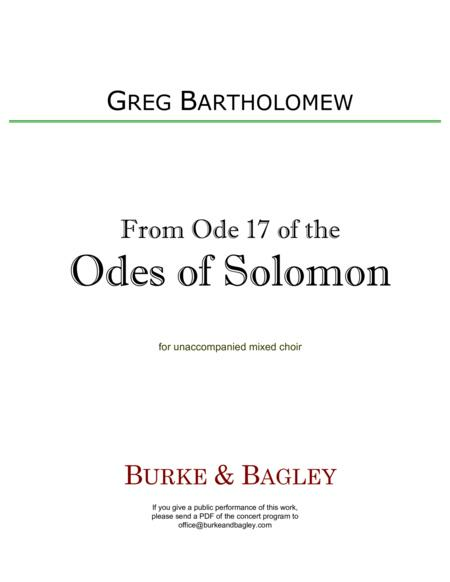 Their recording is available on CD.From the Odes of Solomon is a Project Encore selection. A "Back to School 2015" feature. Duration ca. 5:30. From Ode 17:I was crowned by God, by a crown alive.And my Lord justified me.I was freed from myself and uncondemned.The chains fell from my wrists.The thought of truth drove me.I walked to it and did not wander off.He glorified me by kindnessand lifted my thought to truth.I opened closed doors,shattered bars of iron.My own shackles melted.Nothing appeared closedbecause I was the door to everything.I freed slaves,left no man in bonds.I spread my knowledge and love,and sowed my fruits in heartsand transformed them.I blessed them. They lived.I gathered them and saved them.They became the limbs of my bodyand I was their head.